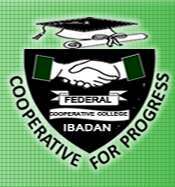 Federal Co-operative College, Ibadan Full Time National Diploma [ND] Post-UTME Admission Screening Exercise for 2018/2019 Academic Session. [Cutoff Mark: 100 and Above], Eligibility and Application Guidelines. Applications are invited from suitably qualified candidates for admission into the Federal Co-operative College, Ibadan Post UTME admission screening exercise for 2018/2019 academic session. Duly completed forms should be returned to the Registrar, Federal Co-operative College on or before the 28th of September, 2018. Credentials of short listed candidates will be screened and might be invited for interview which is usually held in the College premises. Success candidates will be communicated to on or before 2nd October, 2018.